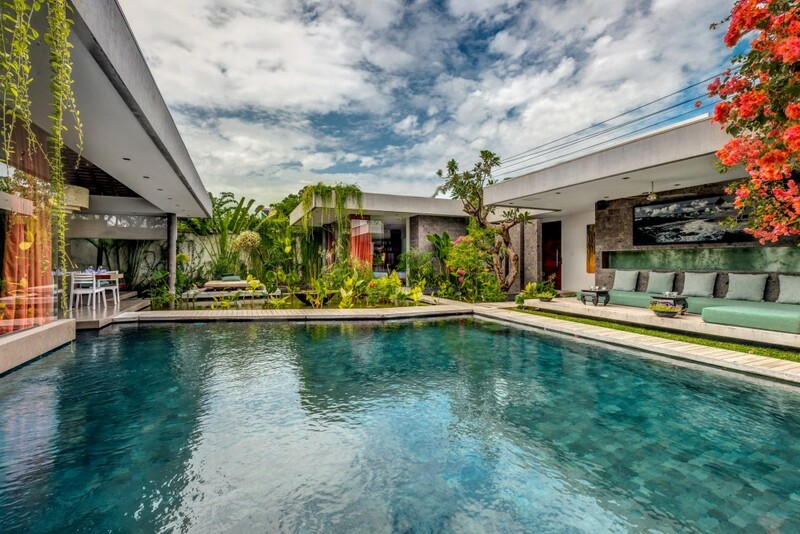 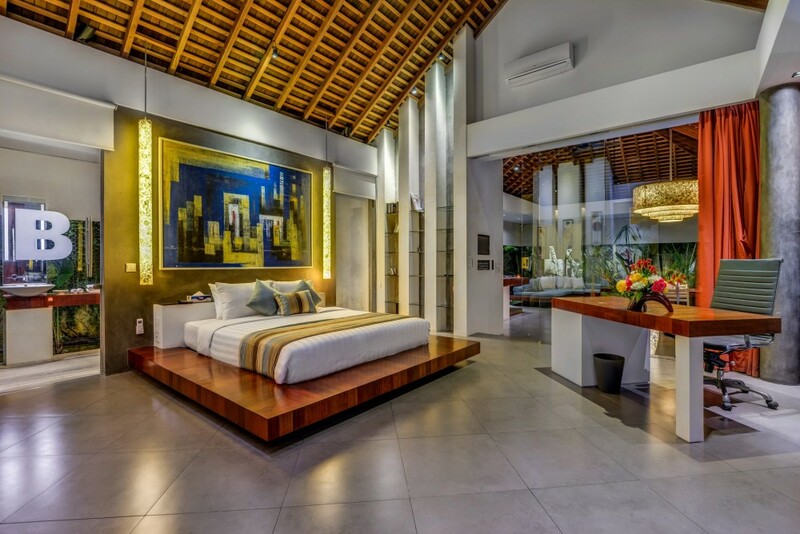 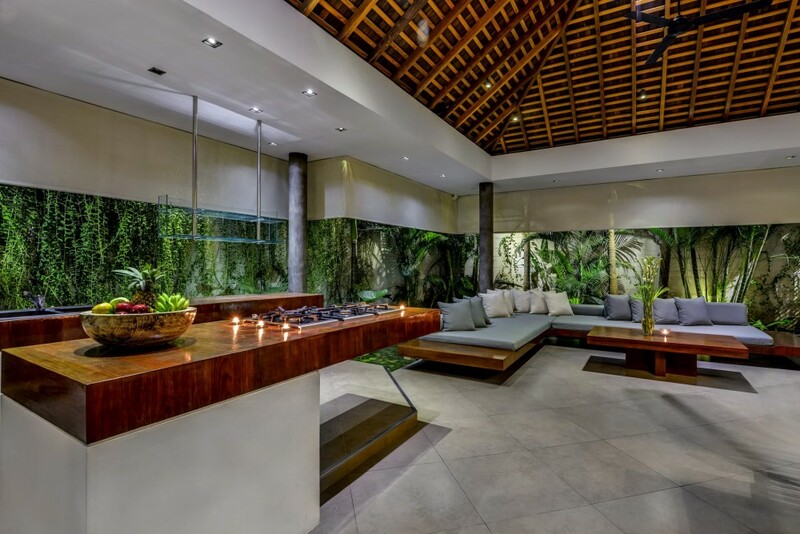 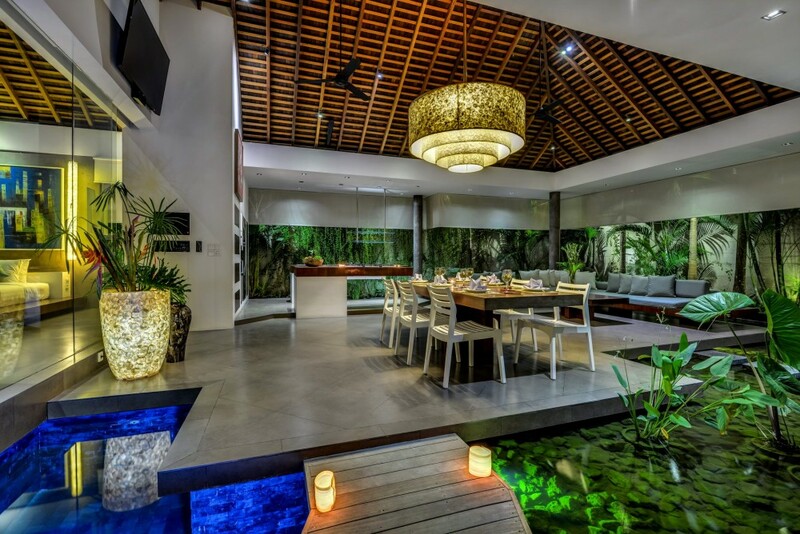 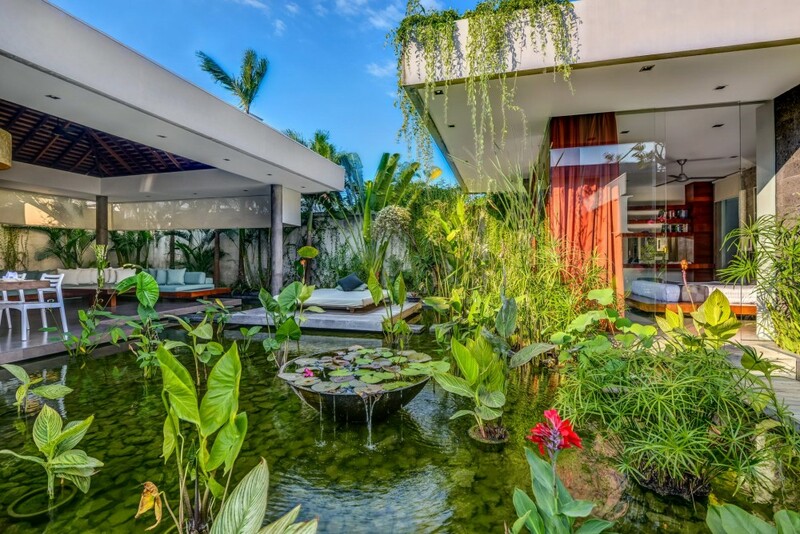 Villa Banyu is a heavenly 4-bedroom Bali villa, perfectly located within Seminyak, just a few hundred meters from the heart of the famous Laksmana and KayuAya commonly known as “Eat Street”. 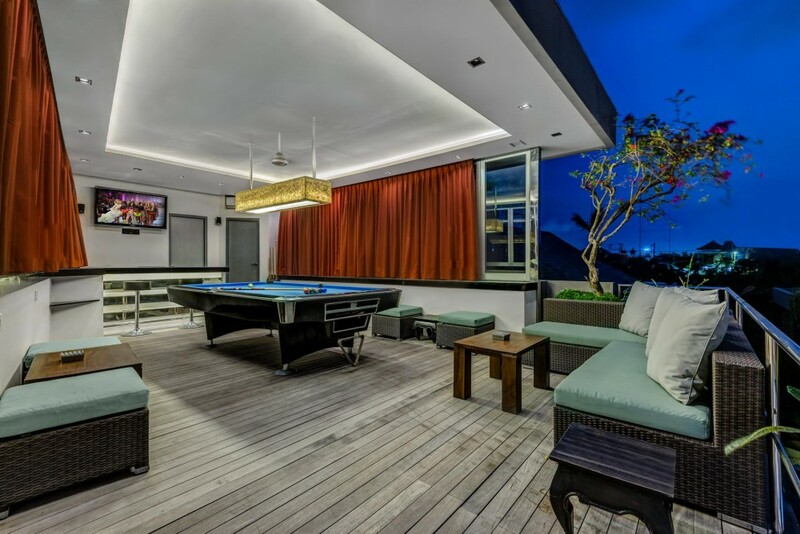 Sleeping 8, guests will enjoy open living areas, pool, water gardens, games&bar room with snooker table and luxury ensuite bedrooms. 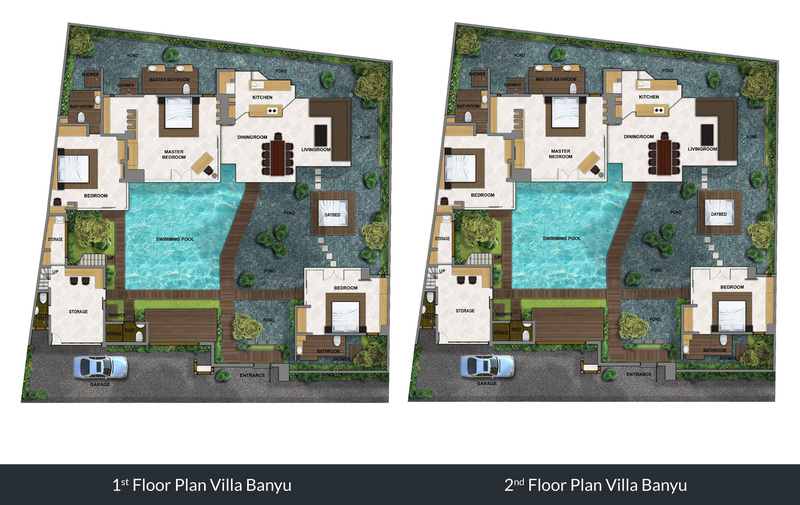 ‘Banyu’ is the Javanese word for ‘Water’ and this is the perfect name for the villa. 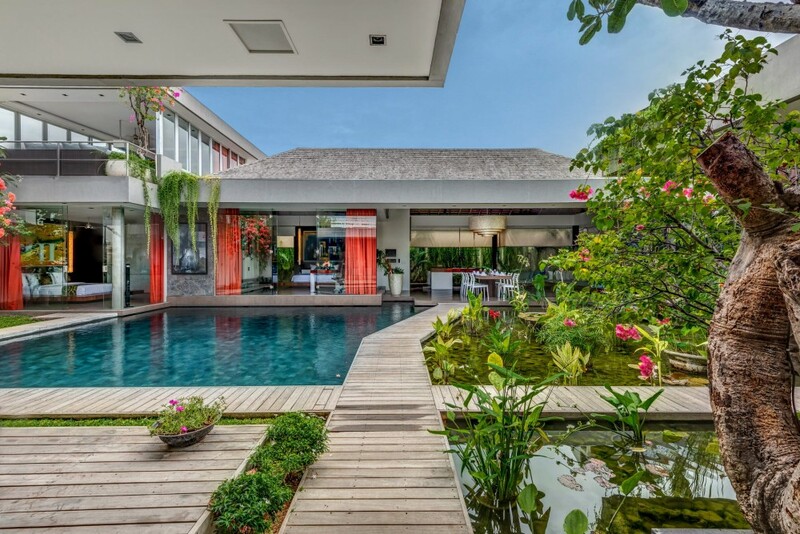 The moment you step through the front door you are greeted by the amazing private pool and huge fish ponds that surround the villa. 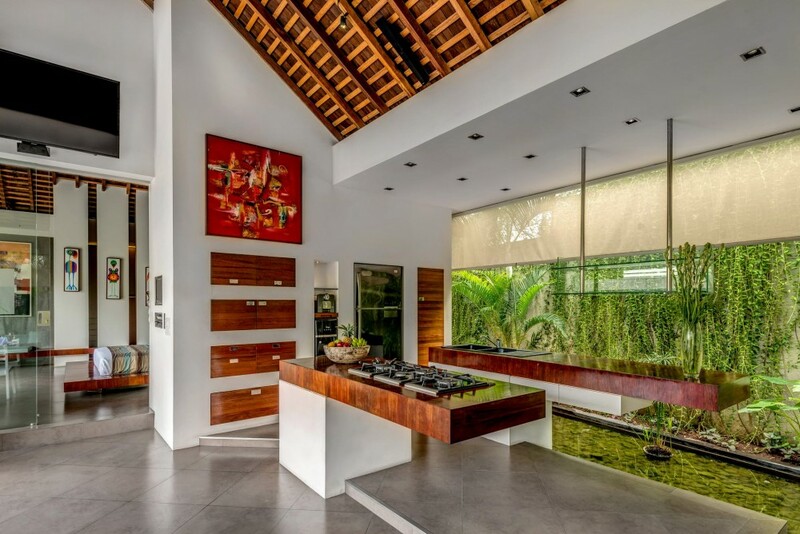 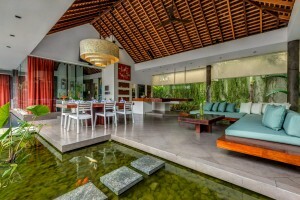 The first level of the villa contains the open living and dining area with open plan kitchen. The dining table can comfortably sit 10 people, with views over the pool. 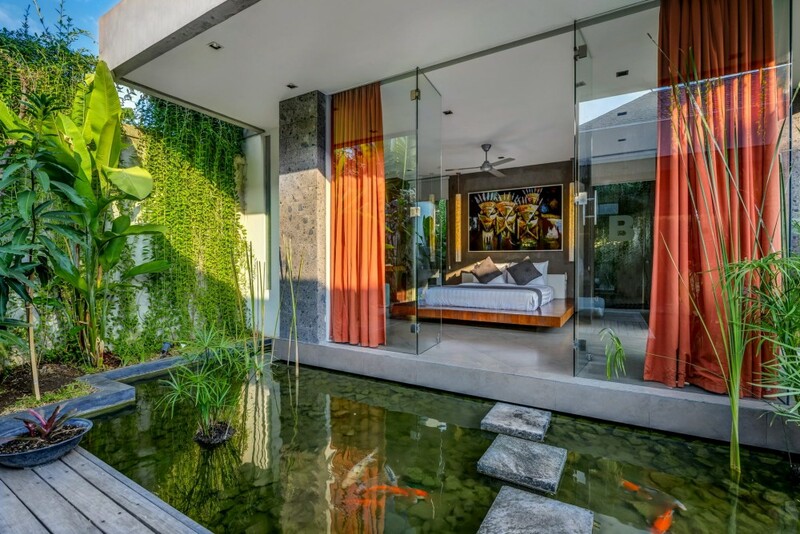 The living room has long comfortable sofas that extend the length and width of this space with a backdrop of hanging flowers and fish ponds. 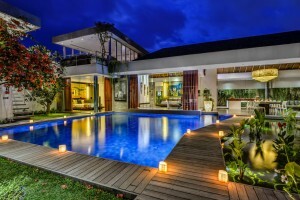 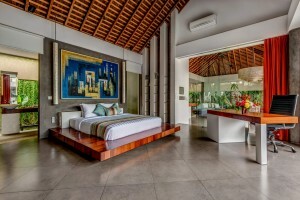 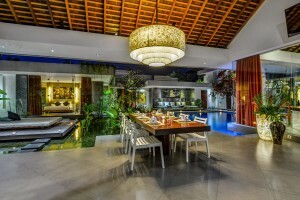 There is a covered outdoor lounge area beside the pool which is perfect for just hanging out with family and friends, and, the villa has a built-in surround sound music system with speakers throughout the villa which can be controlled by zones and just perfect for playing favorite tunes for all to enjoy. 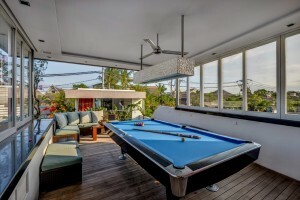 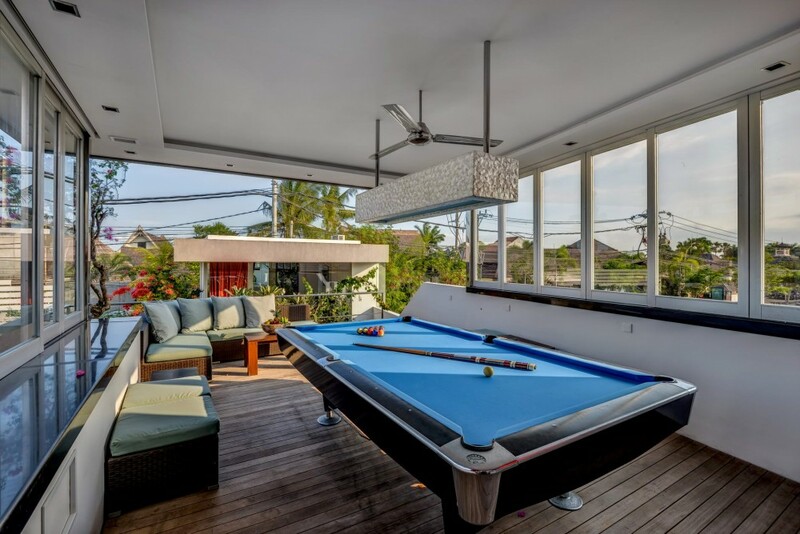 There is a second level to the villa on one side which contains a fantastic bar/games room with pool table. 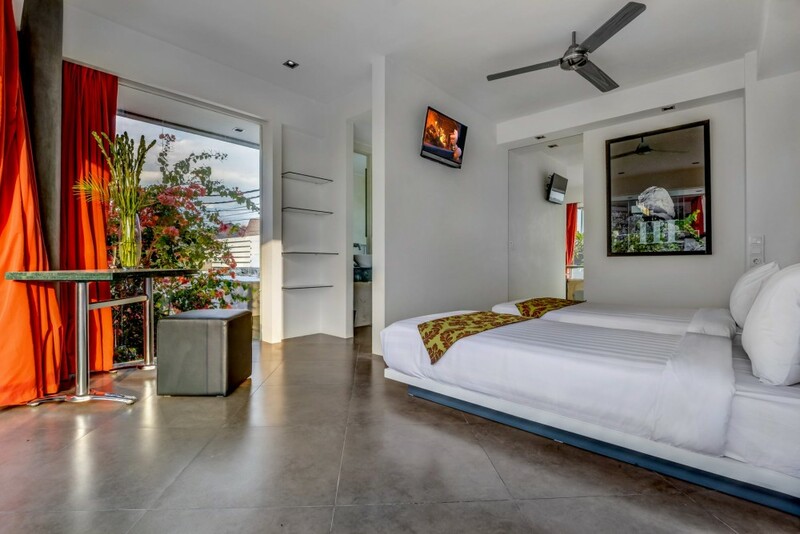 On the ground floor are three of the four ensuite bedrooms each overlooking the pool and featuring flat screen TV’s, DVD player and of course,all are fully air-conditioned. 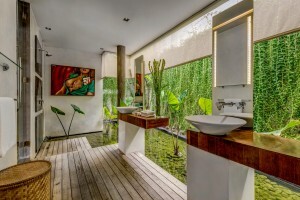 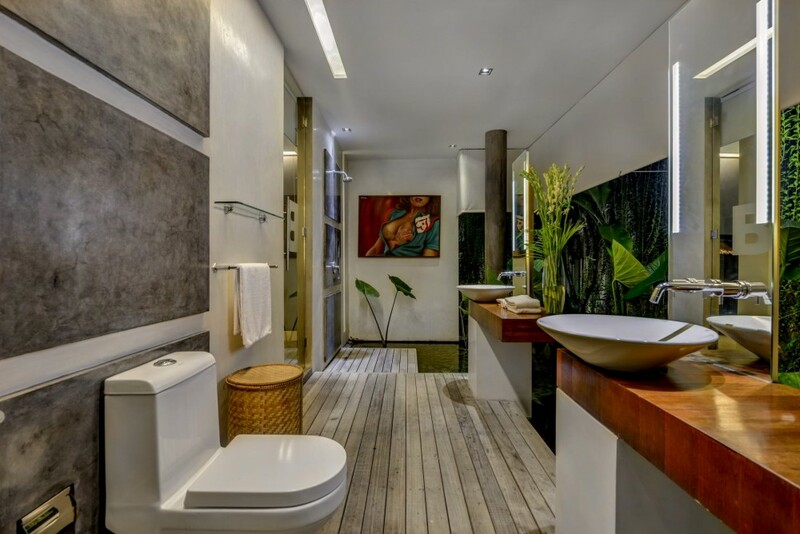 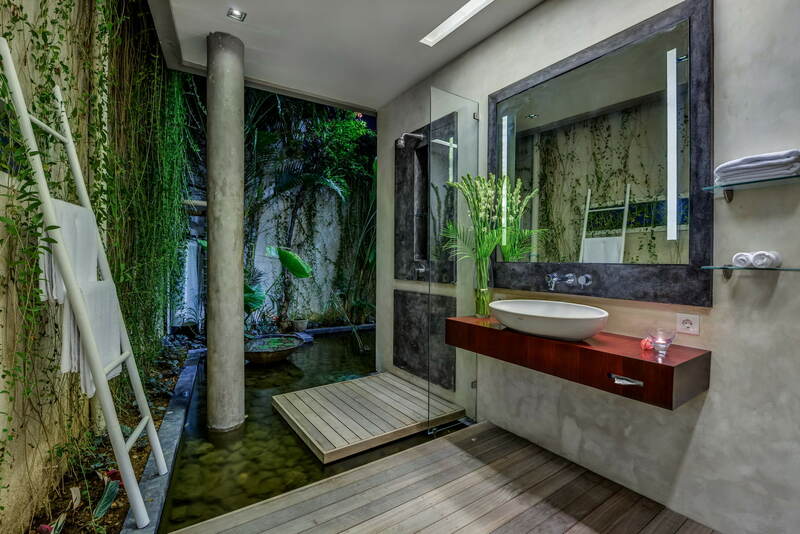 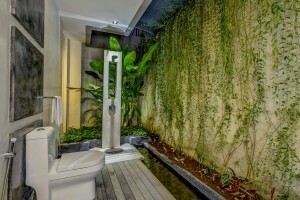 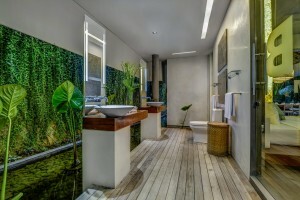 Each of the bathrooms are complimented with showers that stand above the fishponds that run around the fringe of the villa. 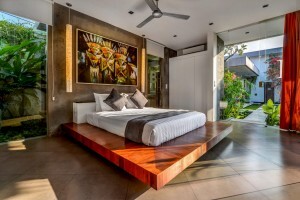 The fourth bedroom located on the first level, near the games room feature twin beds that can be converted to a king with ensuite bathroom. Guests are greeted and introduced to our villa by either our experienced Villa Manager or our Senior Butler. The Villa Manager will always be available to assist with anything you need whether that is arranging in-villa spa and massage treatments, arranging day tours or transport, booking restaurants, or generally just being available to assist with any of your needs or requests. 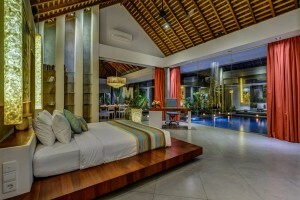 The villa is staffed with professional butler, maid, pool attendants and gardeners. The staff are expertly trained to ensure they are there to attend to your every need, all the while remaining discreet and unobtrusive. 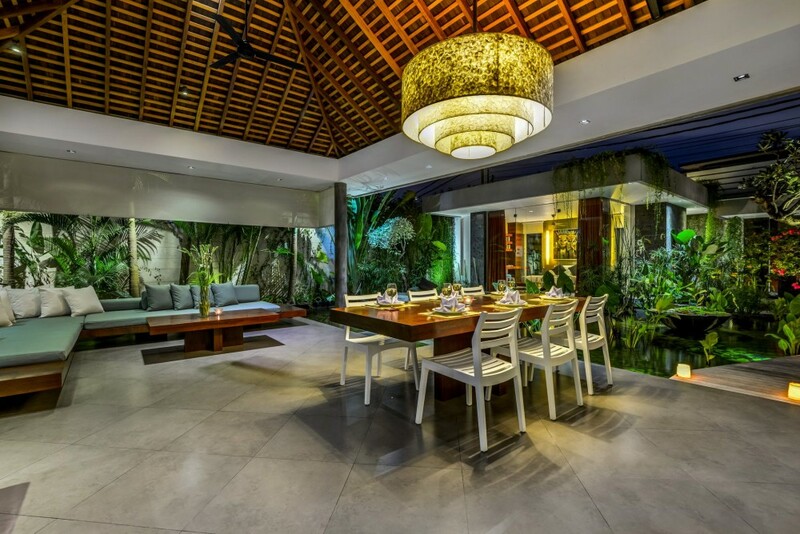 Time and time again, we hear from our guests, that it has been our friendly villa staff that have really made our guests’ holiday something special! 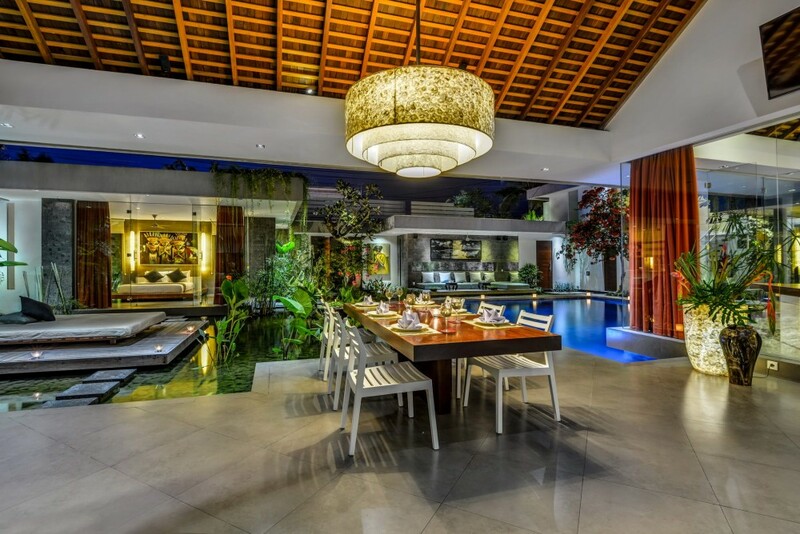 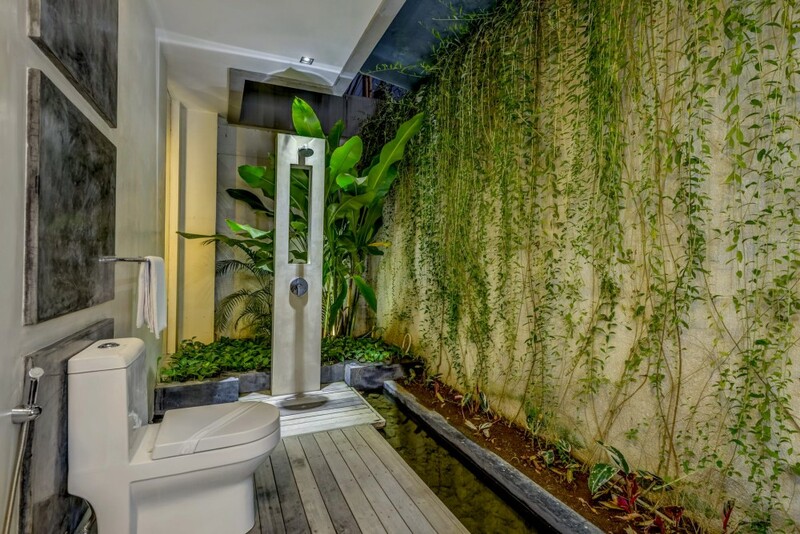 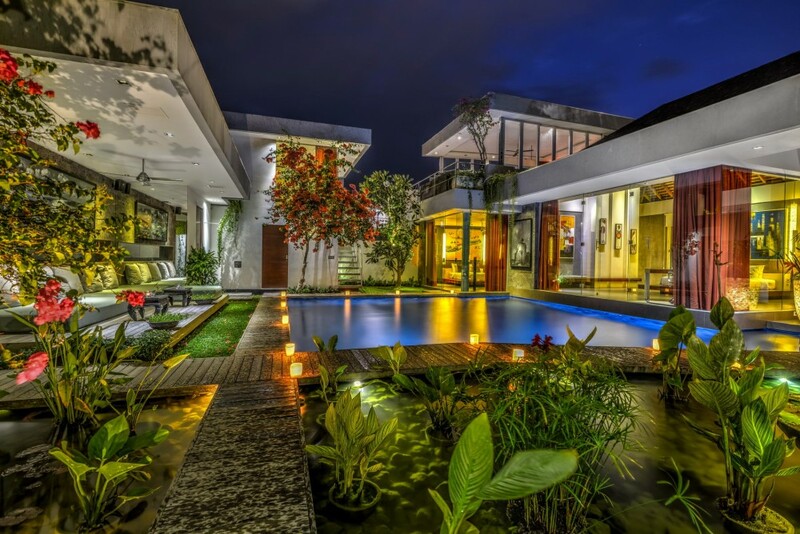 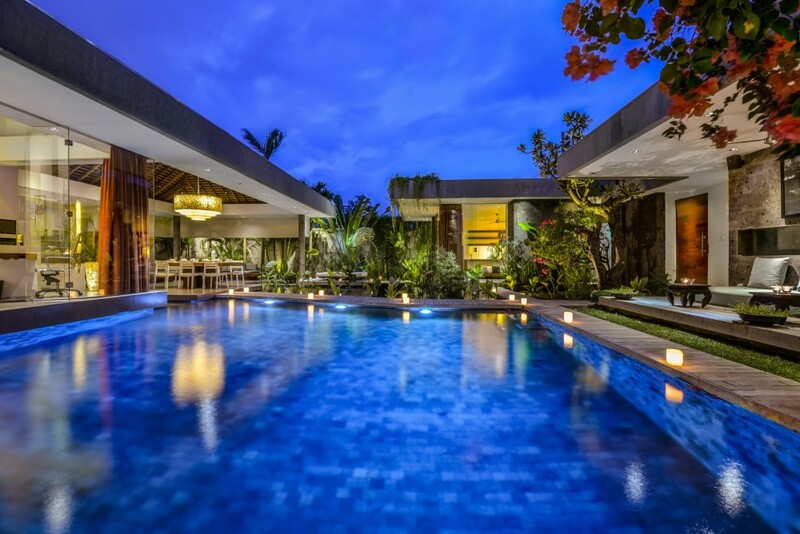 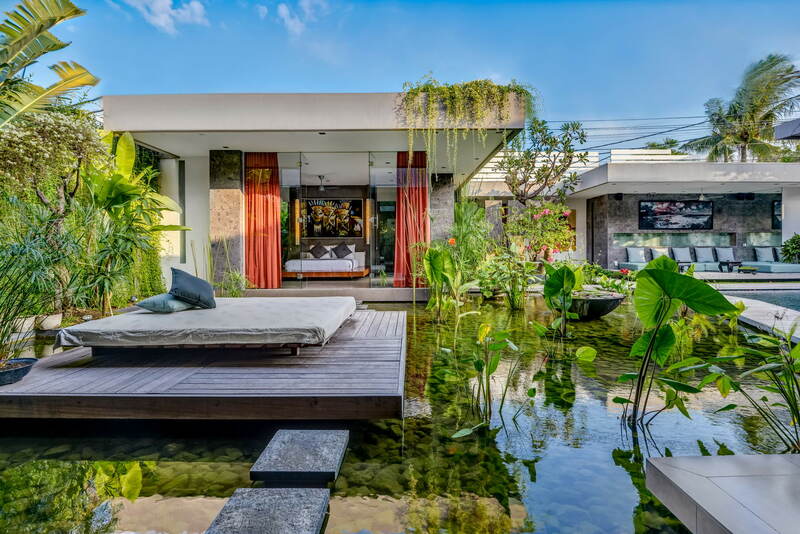 Located on Jalan Braban just round the corner from Eat Street, Villa Banyu is in the center of happening Seminyak. 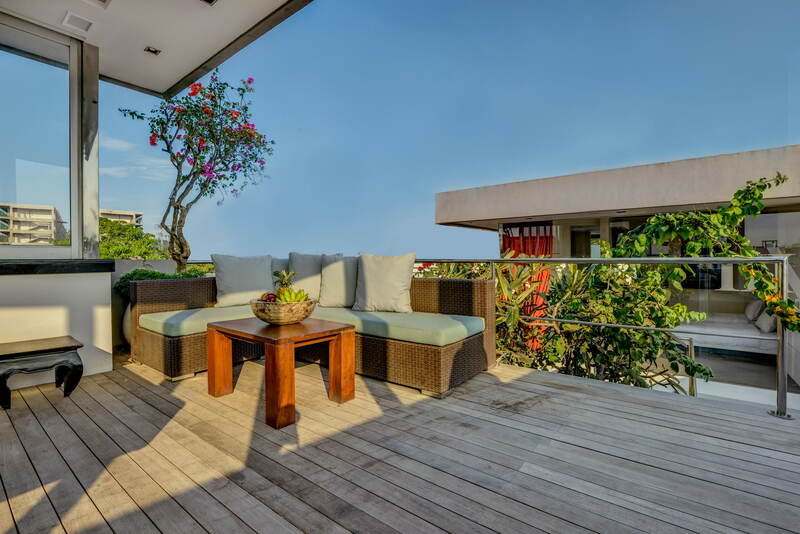 Only minutes away from the beach, it is a pleasure getting lost in the abundance of café’s, high-end boutiques, art galleries, and lavish spas on your walk. Be sure to catch a sunset on Petitenget Beach, famous for its regular Balinese ceremonies complete with gamelan melody players and offerings to the Gods. 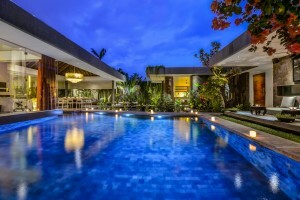 20% DISCOUNT for stays in April 2019. 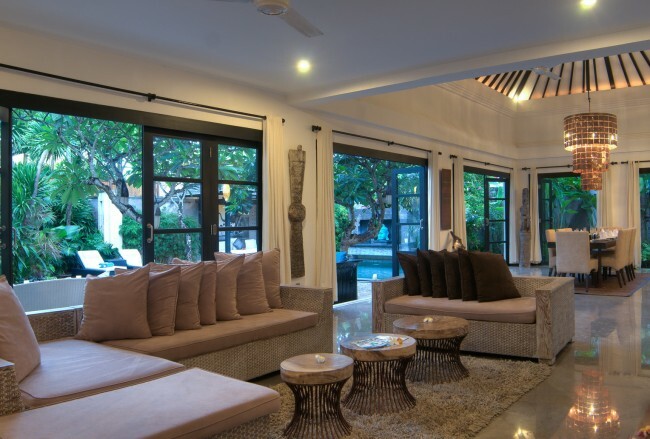 As soon as we walked through the door, we were taken aback by the beauty of this villa. It was so spacious, bounded by a sparkling pond which wraps around the compound. 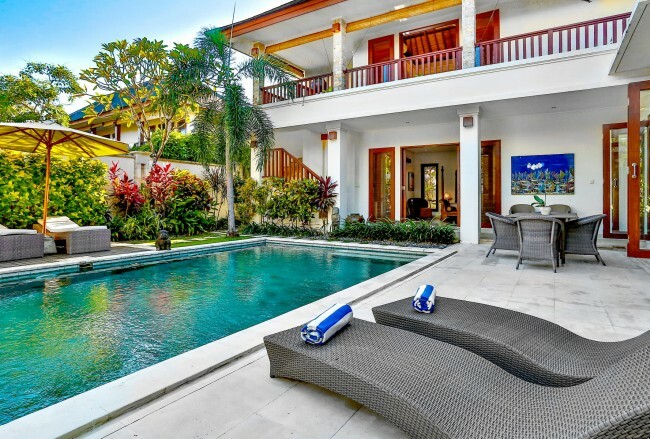 The pictures in the advertisement certainly reflect the reality of the villa. 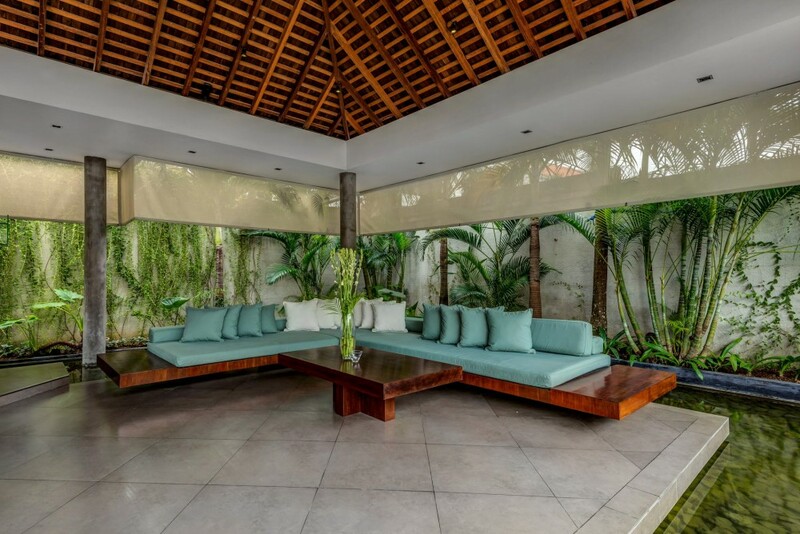 There are so many places around the property to kick back and relax. 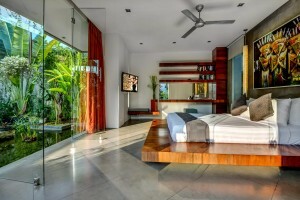 We were a group of guys all in our mid 20’s and couldn’t have asked for a better place to stay. 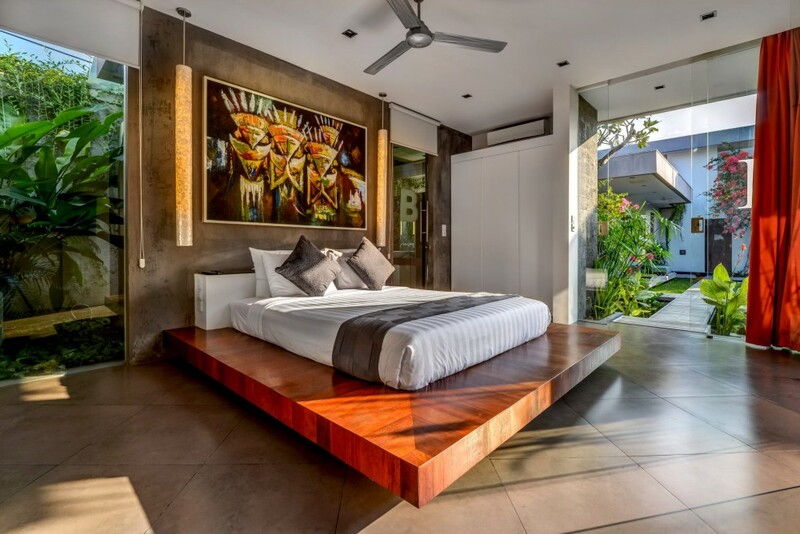 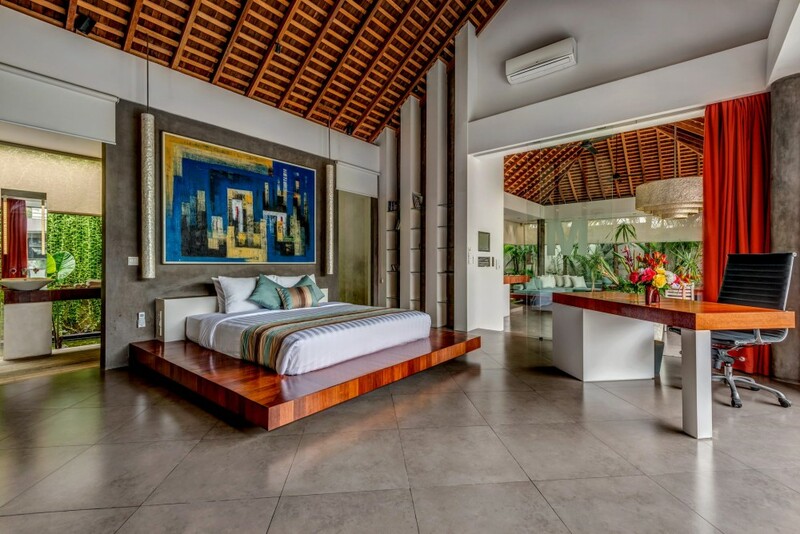 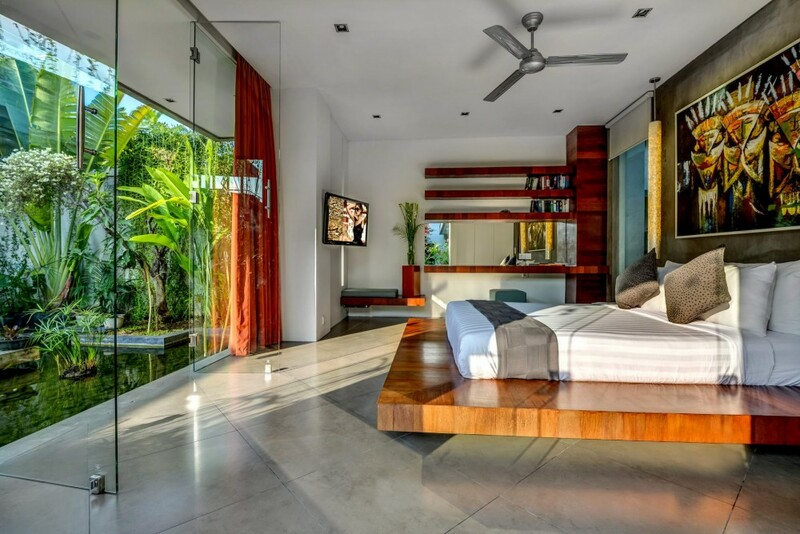 Even though it was middle of the humid wet season all the bedroom were nice and cool with strong air conditioning. 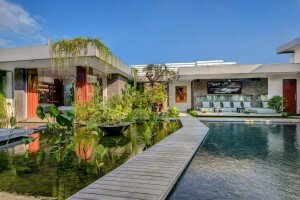 The location was central to everything with the main street of Seminyak only 5 minute easy walk, and there were spa’s and restaurants/bars in the same street 1 minute walk. We would all love to stay again and can certainly recommend to others. 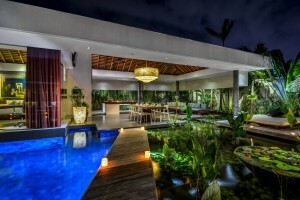 Our stay was a fantastic experience made all the more enjoyable due to your fantastic staff.